On December 2, 2016, we had a wonderful Q&A interview with Robert A. “Bob” Emmons, PhD, the world’s leading scientific expert on gratitude, Professor of Psychology at the University of California, Davis and author of the new book, The Little Book of Gratitude: Create a Life of Happiness and Wellbeing by Giving Thanks. The eMentorCoach News. You can unsubscribe at any time. Why Should You Care About Gratitude? Bob Emmons is the world’s leading expert on the science and practice of gratitude. But why should you care? Why does gratitude matter? Keeping a gratitude diary for two weeks produced sustained reductions in perceived stress (28%) and depression (16%) in health-care practitioners. Gratitude is related to 23 per cent lower levels of stress hormones (cortisol). Dietary fat intake is reduced by as much as 25 per cent when people keep a gratitude journal. Writing a letter of gratitude reduced feelings of hopelessness in 88 per cent of suicidal inpatients and increased levels of optimism in 94 per cent of them. Gratitude is related to a 10 per cent improvement in sleep quality in patients with chronic pain (76% of whom had insomnia) and 19 per cent lower depression levels. Gratitude empowers us to take charge of our emotional lives and, as a consequence, our bodies reap the benefits. As a treatment, gratitude is cost effective, quick, and available to everyone. There are no known negative side effects. Gratitude increases self-esteem, enhances willpower, strengthens relationships, deepens spirituality, boosts creativity, and improves athletic and academic performance. Given the range of these positive outcomes, gratitude has fittingly been referred to as the quintessential positive trait, the amplifier of goodness in oneself and others, and as having unique ability to heal, energize, and change lives. 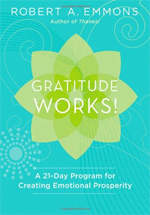 ABOUT THE LITTLE BOOK OF GRATITUDE: Create a life of happiness and wellbeing by giving thanks. The author of the new book, The Little Book of Gratitude, as well as 5 other books on gratitude and positive psychology and the founding editor and Editor-in-Chief of the Journal of Positive Psychology, Bob Emmons has been called the “gratitude guru.” He has indeed become the world’s foremost authority on gratitude, a sometimes overlooked component of happiness. Bob has been publishing on gratitude for 15 years, but this is the book you should buy. This is the book you should recommend to your clients. It is VERY different from Bob’s other books on gratitude. It’s beautifully illustrated and filled with little gems of wisdom. It has dozens of practical activities and exercises. And coming in at 95 pages, it can be read in about an hour! In short, The Little Book of Gratitude is about using gratitude in a simple yet scientific way to increase happiness and find greater joy, love and peace in our lives. It’s Bob’s latest summary of the findings, interventions, exercises and practical wisdom of this vitally important area. You’ll love it. Robert A. 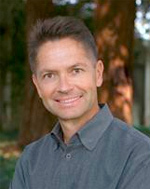 “Bob” Emmons is the founding editor and editor-in-chief of The Journal of Positive Psychology. Widely regarded as the world’s foremost expert in the study of gratitude, Dr. Emmons was one of the early pioneers in the positive psychology movement. He continues to be a key leader. Bob received his BA in Psychology at the University of Southern Maine in Portland (1980), and his MA 1984) and PhD (1986) in Personality Psychology at the University of Illinois at Urbana-Champaign. After a two-year stint on the faculty at Michigan State University, Bob migrated to the University of California at Davis, where he quickly climbed the ladder to full Professor by 1996. Besides his role as editor of the most important journal in the field of Positive Psychology, Bob has published over 150 articles for academic and popular media, has had and continues roles as editor, editorial board member and reviewer for over 18 other professional journals, and is author or editor of six books in the areas of positive psychology, health, and spirituality, including Thanks! How the New Science of Gratitude Can Make You Happier (Houghton Mifflin Harcourt), The Psychology of Ultimate Concerns: Motivation and Spirituality in Personality (Guilford), Words of Gratitude for Body, Mind and Soul, The Psychology of Gratitude (Oxford University), and Studying Persons and Lives (Springer). He is Past-President of the American Psychological Association’s Division 36, The Psychology of Religion. Over the years, Bob has received research funding from the National Institute of Mental Health, the John M. Templeton Foundation, and the National Institute for Disability Research and Rehabilitation. His research has focused on personal goals and purpose, spirituality, personality integration, and subjective well-being–topics is at the intersection of personality psychology, the psychology of emotion, and the psychology of religion. As Director of the University of California-Davis Emmon Laboratory, Bob recognizes that gratitude has been the “forgotten factor” in happiness research, and his primary long-term goal is to create and disseminate scientific data on the nature of gratitude (or thankfulness), explore its nature and factors, establish ways to measure it, identify potential consequences more gratitude might have for human health and well-being, and cultivate and increase gratitude in daily life. Bob lives with his wife, Yvonne and their two sons, Adam and Garrett, in Davis, California and appreciates the countless opportunities his family offers him for experiencing gratitude–in fact, he identifies them as the main sources of thanksgiving in his life. Is Gratitude Queen of the Virtues? What Must We Overcome as a Culture or as Individuals For Gratitude to Flourish?